Royal icing marbling is one of the easiest decorating techniques producing show-stopping results in the matter of minutes. 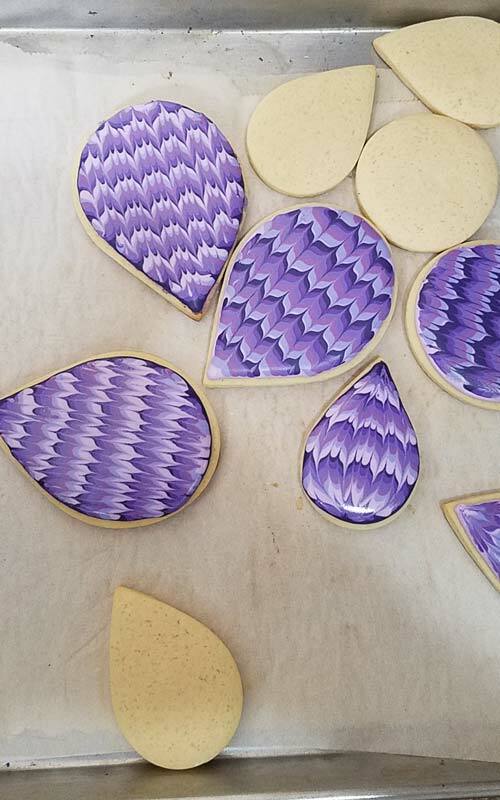 I used the marbling technique to make 50 Shades of Purple Marbled Cookies. 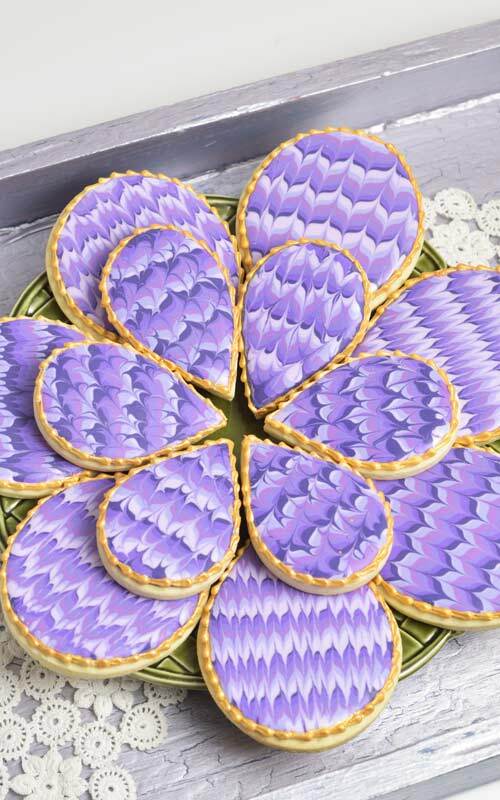 I think Royal icing marbling technique is one of the most rewarding cookie decorating techniques out there. 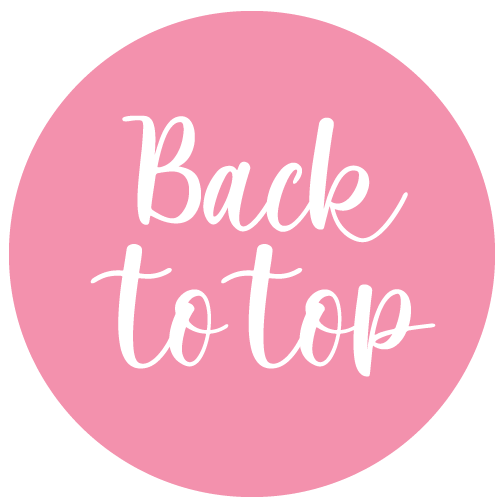 It’s fast, easy and so soothing to watch. 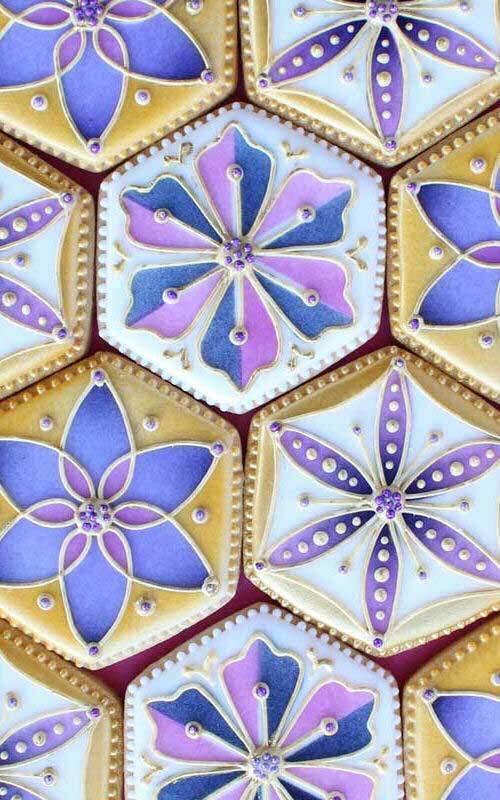 Marbled royal icing designs are especially popular around Christmas time. I also used this technique to make colorful Christmas Ornament Cookies. I used 6 different shades of purple. To make purple I used Electric pink, Sky blue and Royal blue. You can use readily available purple food colorings, however I find I’m able to achieve the best results using electric pink and sky blue. For deeper purple shades add a touch of royal blue color and red. 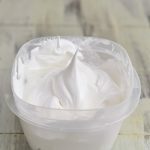 Consistency of royal icing is crucial for marbling technique to work. 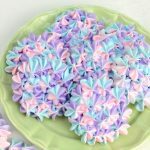 Be sure to work fast so the icing doesn’t start crusting before you have have a chance to marble royal icing. 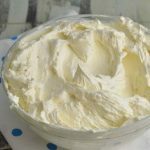 Use flood icing 10 – to 15 seconds consistency. Depending on how fast you can pipe the lines you may want increase the fluidity of your icing, especially if it’s crusting too fast. 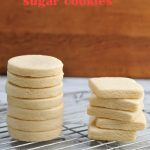 I suggest, when using 10 seconds consistency, outline the cookie first with 20 second consistency and then use 10 seconds consistency to flood. I find that making the outline first and then filling the inside of the cookie helps to keep the edges clean. Let the marbled icing dry. Then using a round piping tip #2 pipe the decorative border with a medium stiff consistency. When making gold luster dust paint it is important not to add too much alcohol to luster dust powder or the paint will be too thin. If you happen to add too much let the paint sit for several minutes. Alcohol evaporates pretty quickly and your paint thickens as it sits. You only need little amount of powdered gold luster dust; use a dropper to add few drops of alcohol. Use a paint brush to mix the powder until it has a smooth consistency. 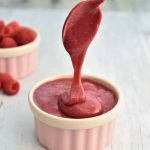 It shouldn’t be too liquidy. 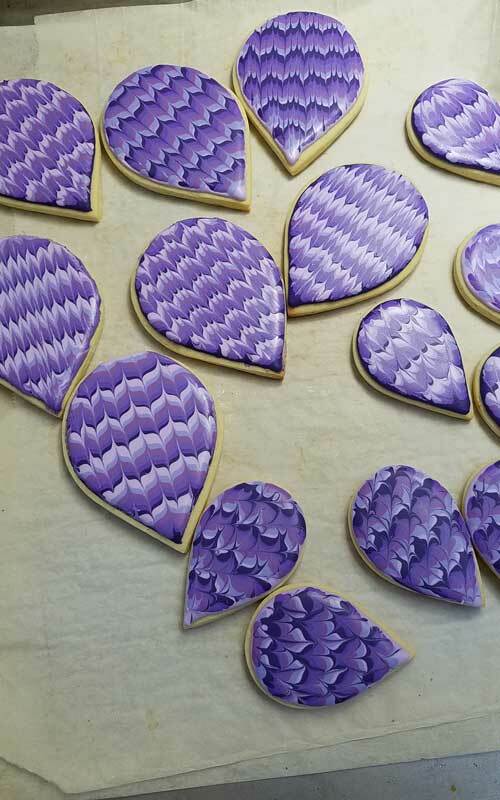 Before you paint royal icing, let it dry completely. Paint dry beaded border with the gold luster dust paint. I teamed up with my friend Marlyn of Montreal Confections in a 50 Shades of Purple Collaboration. 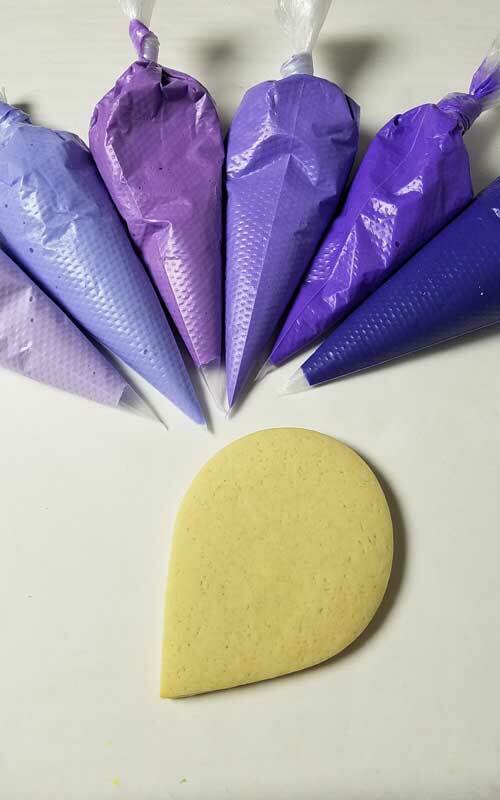 Idea was to use different shades of purple for our cookie projects. 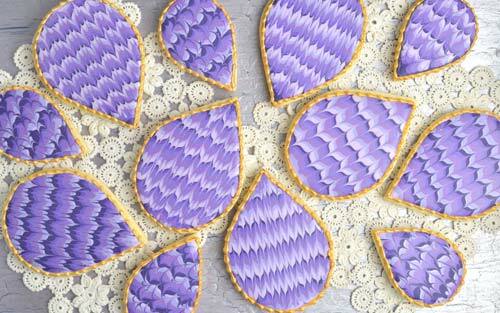 Marlyn made these gorgeous Hexagon Tile Cookies and you check out her step by step tutorial here.